Here is the abstract and embedded video for one such talk released via @CyLab @YouTube. Wireless sensor networks (WSNs) are distributed collection of small sensor nodes that gather security-sensitive data and control security-critical operations in a wide range of industrial, home and business applications. The current developments in the sensor technology and ever increasing applications of WSNs point to a future where the reliability of these networks will be at the core of the society’s well-being, and any disruption in their services will be more costly than ever. There is thus a fundamental question as to how one can design wireless sensor networks that are both secure and reliable. In this talk, we will present our approach that addresses this problem by considering WSNs that employ a randomized key predistribution scheme and deriving conditions to ensure the k-connectivity of the resulting network. Random key predistribution schemes are widely accepted solutions for securing WSN communications and the k-connectivity property ensures that the network is reliable in the sense that its connectivity will be preserved despite the failure of any k − 1 sensors or links. For more information on the work of CyLab researcher Osman Yagan. 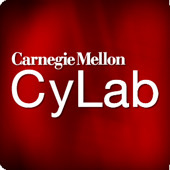 For more information on the CyLab corporate partnership program.